A bit belatedly, we celebrated Ostara last night. However, the timing worked out excellently as it was also a penumbral eclipse of the moon in Libra. So with the equinox, the eclipse, and the Libra vibes, this Sabbat was about the balance SO HARD. Three points of the triangle, three realms, three witches. Tonight all are perfectly converge on this point that is our covenstead. Two seasons balance on the equinox to create a third: the time in between. The sun, the earth, the moon, alight to create eclipse’s shadow. The triangle’s edge and the world beyond cleave to create this sacred space. Two points intersect to make a third, two points merge to make new whole. Three times two to create one. Midnight! Still point of the spinning earth fixed upon your pole star. The seasons circle by your design. Here is the fulcrum upon which the seasons balance! Sunset! Primordial waters of the sunset, flood into us from the ancient abyss. The eye of the hurricane, you are the center of this sabbath of transformation. Sunrise! Gilded aurora of the dawn sun. As you will, the celestial bodies clash, merge, and reconcile again. This is the season of your increase as day overtakes the night. O, come and be our, Blade. Below! The earth’s warm depths into which all things descend and emerge. Welcome us into the arms of our ancestors. Above! the etheric void, the magic of the unknowable oblivion. Moonrise! Our circle’s edge, embracing all that is lit by your orb. Border of the betwixt and between, the equinox is your delight. Within! We converge upon this crossroad. We are the equinox and the eclipse when the sun, the moon, the earth, day and night, light and shadow, align. The opening prose was adapted from a ritual I wrote last year for another working group. That call used 8 points,so that ritual was about twos and mathematical squaring, 2 x 2 x 2, etc. The Uncoven witches, on the other hand, have been playing around with a three point “triangle” rather than a circle. You can hear more about using 8-point calls and triangles to set up the circle in our Yule Ritual podcast! Anyway, to fit the theme of threes into a holiday all about balance which tends to be symbolized by two equal halves, I tried my best to use the number three to symbolize the blending of twos into a third overlapping space or twos merging into one. These guys are pretty analogous to the traditional 4 compass directions (north, west, south, east). Sunset is effectively the same as traditional west since that is literally where the sun sets and both use the element of water. Same for Sunrise in the east. Depending on your transition east can be the element of air or fire. I usually do fire in the south because I think of high noon, or south pointing to the equator and heat and I use air for east by process of elimination. For this invocation, I decided fire went best with Sunrise and the dawn goddess domains of beginning, light, and energy. Midnight is north since that is the direction that the sun does not travel across (int he northern hemisphere). The element is similar to the traditional northern earth, but I made it a bit more specific with metal/crystal with Midnight/north earth being crystalline or inorganic and Below being organic, literal earth or soil. As with my other rituals, I work counter-clockwise hence the north, west, east order.I chose names that were commonplace directions rather than compass points. A lot of people don’t know where due north without a compass, but most people know the general direction of the sun’s path around their home. This set represents the vertical axis. If the triangle is a flat, 2 dimensional shape on the floor, this second set adds the third dimension of height and depth. I’m still working on the order for these ones. I feel like they should correspond somehow with the first three somehow. Midnight and Below are both earthy– Midnight is metal/crystal, Below is organic earth or soil. On the other hand, I see Midnight and Above/Void as being crone energy as both directions are kind of witchy and mysterious. On the other hand, the order could be stacked by how it appears on the axis; right now it is not. Going in order would yield Below, Moonrise, Above bottom to top or Above, Moonrise, Below. Although as a grounding an centering, I do like bringing up energy from the ground, pulling down energy from above, and mixing it in the middle which would be the order that I used. So, yeah. Not quite hammered out yet. I’m also not set on the names. I shoved “Moonrise” in there because I knew we’d be doing the ritual when the actual moonrise was happening and that it would look rad. Plus, why let the sun have all the fun when we usually work at night? However, this leaves Above and Below the odd ones out as they are directions, not times. So perhaps they will get more poetic astronomical titles like Nadir and Zenith if that doesn’t feel too pretentious. “Within” came from my 8-point grounding, but I think for the purposes of this 7-point call, it will probably also due for a name change. In the 7-point system this seventh point represents the sum of the other six and signifies the witches together and the magic space and a self-contained entity. Another kind to fuss with in future rituals. 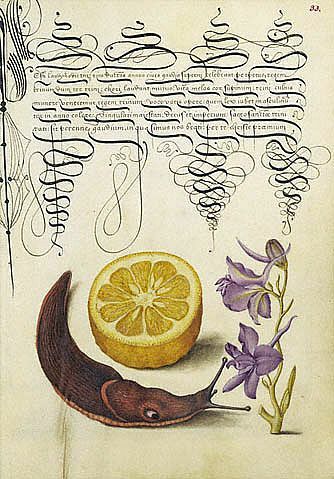 Joris Hoefnagel Sour Orange, Terrestial Mollusk and Larkspur, 1596. source. I go down my well using my coven cord. I drop down and land in a red wasteland. The dusty sand is red the sky is yellow and hazy with heat. The landscape is scarred by fissures in the dry soil. the soil is fecund with fresh moss and shoots. It is the Egyptian Underworld where the boat of the sun passes each night. As I realize this, I call to Anubis. He appears, but rather than embracing me, states that I must journey alone. I step into the barque, feeling uneasy and unprepared. parting the shimmering drafts of heat before us so we drift on a cool current. Rather than ascend back into the mortal world, I disembark at a tiny temple. It is a open-air courtyard of bone-white marble. Anubis and Nepthhys anoint me. Nephthys gathers my soul parts in jars making sure each is whole and and properly housed. They give me a draught of oily black liquid. At first think it is embalming fluid and struggle to sit up, shaking violently as it goes down. Then I wonder if it is the water of the Nile. I climb up a pillar carved and painted like a stylized lotus. This journey took place as part of a ritual on the Vernal Equinox/ lunar tetrad eclipse. The conversation preceding the journey was a discussion of primordial, pre-creation gods and forces including, not surprisingly, Nun. I was reclining in the Jivaro South American Lower World posture. Another journey using this pose took place in the Greek underworld. The Power of Ecstatic Trance: Practices for Healing, Spiritual Growth, and Accessing the Universal Mind. Nicholas E. Brink, Ph.D. Ecstatic Body Postures: An Alternate Reality Workbook. Belinda Gore. I stand at the World Tree and am drawn upwards. All sharp, clean lines and smooth surfaces. and descends back down as a well. It glows with white-blue light. but is is really starlight. I ask, do I choose the World or the Wheel of Fortune? In my deck, the Wheel is called Wyrd. Wyrd is the wood that fashions the temple of the gods. The Tree is an axis going up and down. Moreover, The weave of Fate’s tapestry is also the fabric of the tree. It is what the Tree is made of. or a moth fashioned into itself inside its chrysalis. When she is done, I blurt out that I have to go back right away and write everything down or I will definitely forget! As you should. As is my delight. To write is to remember and to remember may be to know. I drop back down through the realms to the base of the Tree. Amaroth is a divine guide of my invention. She is the personification of Order and is a goddess of knowledge, writing, fate, and balance. One of her symbols is the North Star which is probably the source of my image of the mill and of starlight. As a patroness of writing and study it is not surprising that she would be amused at me rushing off to take notes!